7/8″ insulated glass provides year round energy savings and an excellent sound barrier to outside noise. Interlocking meeting rails for tighter seal for added security. DYC fully insulated storm doors with operating sashes and security deadbolts. High performance, high quality, high security. 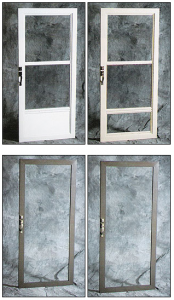 Superior quality storm doors at affordable prices! Several colors to chose from and numerous door styles and hardware options available.